Florida overwhelmingly voted to ban greyhound racing, which means that by the end of 2020, thousands of dogs could be out of jobs. The good news is that you can adopt greyhounds at any time. They are very good dogs. Our most current information is that there are some 4000 greyhounds now on Florida tracks, and we can assume that their owners might opt to move some of them to the 5 states that still have dog racing. There is greyhound racing in Mexico as well. 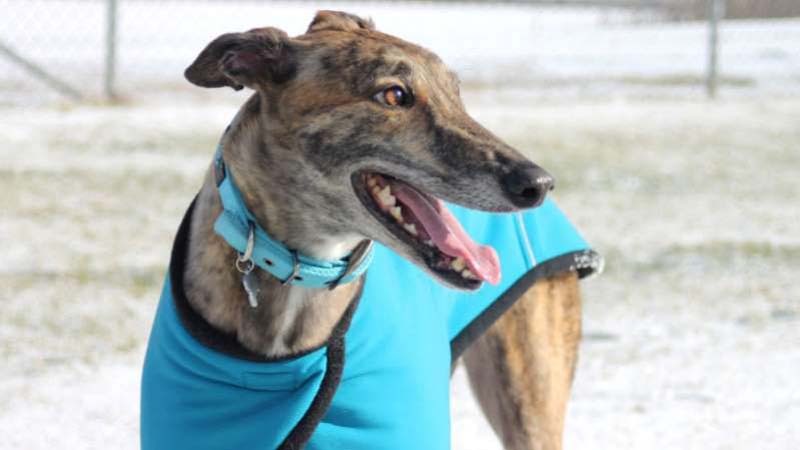 Faster dogs may be able to continue their careers by competing at another track, but the Greyhound Adoption Action Alliance notes that slower dogs at lower-paying tracks often have nowhere to go. By mid-2019 there should be more information about which tracks are closing when, and what the dogs’ owners might end up doing with them. Each dog has its own owners, so it’s up to them, not the track, whether and how they are put up for adoption. Currently, rescue groups in the few remaining states where racing is legal ask owners to donate their dogs, and then they network with other groups so that greyhounds can be adopted nationwide. I adopted mine while I lived in New York, but one came from Kansas and the other from Massachusetts. The Florida groups don’t yet have information about how to adopt Florida dogs, but I’d bet they will travel through local groups in this way. Getting in touch with your local rescue group is probably the best way to find out when dogs from Florida will be available. Have you ever met a greyhound? You should meet a greyhound. (I’ve adopted two, and they were wonderful.) Google “greyhound rescue [your area]” and you’ll probably find several local groups that can arrange adoptions. Greyhounds are weird dogs. They curl up on the couch like cats. They tend to be very calm, often sleepy. They enjoy running, but only as a hobby. Most of the time, like you and me, they’d rather lounge around and watch Netflix. I adopted my first greyhound when I lived in a 500 square foot apartment, and the adoption group didn’t bat an eye. They just paired me with a mellow dog and I took her for a long walk every day. Greyhounds can run off unpredictably (they love you, but sometimes they just need that squirrel), so it’s best to keep them on a leash or in a fenced-in yard. They have thin skin, so they like to wear blankets and pajamas in cold weather. They tend to get along great with other dogs, but some of them have such a strong prey drive that they try to eat cats. If you have cats (or small dogs), let the greyhound rescue know that you need to be matched with a grey that isn’t going to chase them. Some greyhounds just don’t care. Because greyhounds spend their careers in kennels, they tend to be very used to people and to other dogs, and they take to a crate right away. But they have probably never seen stairs or shiny kitchen floors, and may freak out just a little before they learn how to make their stick legs walk on these foreign surfaces. If you could use a friendly, awkward dog in your life, find your local rescue and ask if they do meet-and-greet events where you could get to know a few hounds. (Many rescues operate out of people’s homes, so there isn’t always a shelter to visit.) Maybe you can give one of these unemployed dogs a forever home.